You are here: Home / The Smart Dog Blog / Science of dog behavior / How do your emotions affect your dog? 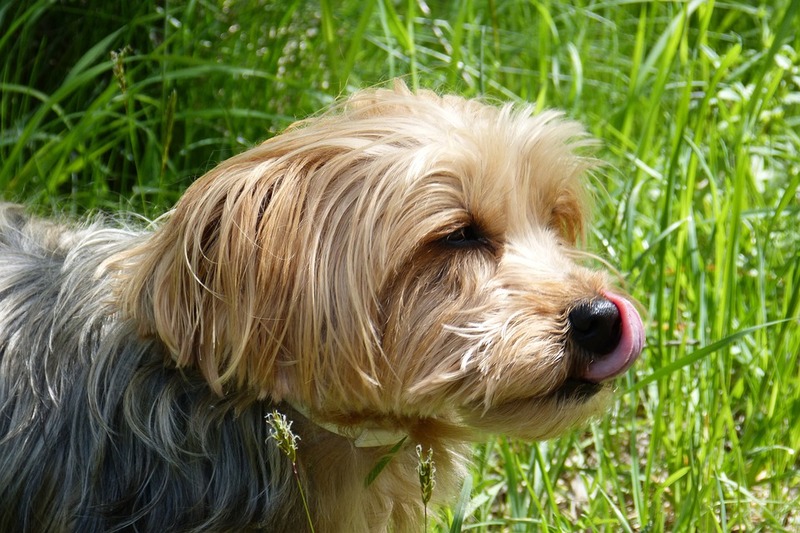 You may have heard that dogs “lip lick” or “tongue flick” when they are stressed. A recent study by Albuquerque et al. (2018) used lip licking in dogs to assess their ability to respond to emotional cues in humans and dogs. Previous research suggests that dogs can differentiate between happy and angry facial expressions in both humans and dogs. This paper took that concept a step further and asked if dogs are able to respond appropriately to those emotions. Why is this important? How dogs respond to our body language and emotional state influences our relationship with them. It’s possible that dog who struggle to recognize and correctly interpret our emotional state also struggle to adapt well to family life. Imagine that Fluffy steals a favorite shoe. Her owner is furious, but Fluffy does not recognize this – or maybe doesn’t care. As a result, Fluffy may be more likely to repeat the same behavior in the future, leading to more tension between her and her owner. On the other hand, dogs that are overly sensitive and responsive to an owner’s emotional state may struggle as well. For example, Lassie may have a difficult time regulating her own emotions when family members get emotional, increasing the likelihood of mouthing or even aggression in times of emotional intensity. This also has implications for dog-dog interactions. It’s easy to see how dogs that are insensitive – or hypersensitive – to other dogs’ social cues might have a difficult time interact appropriately with other dogs. Seventeen dogs of various breeds and ages participated in the study. About half were male, half female. This is a small sample size, yes, but this is typical in cognition studies on dogs because it is often difficult to recruit dogs. The dogs were simultaneously presented with pictures of humans or dogs – happy/playful or angry/aggressive – and sounds (positive, negative, neutral). During the presentation, the dogs’ body language was observed and recorded. Dogs mouth licked significantly more often when they were looking at negative (angry or aggressive) faces than positive (happy or playful) faces. They also licked more often in response to human faces, compared to dog faces. Interestingly, the sounds had no effect on their behavior. The results suggest that dogs may react appropriately to negative emotions. That is, dogs seem to be able to interpret these negative facial expressions as what they are – an indication of a negative emotion. Further, their interpretation triggers a corresponding emotional response in the dog, indicated by mouth licking. If the mouth licking was a more general response to stress, you would expect to see it consistently across ALL conditions. Instead, they only showed increased mouth licking when presented with images of negative emotions. This may seem self-evident to many of us – yes, dogs know when you are upset and it impacts their behavior. However, having observations tested by research is always a good idea. Remember how much trouble we got into by making assumptions about dominance in dogs without good research? It can lead to all kinds of misconceptions, which can have serious implications for animal and human welfare. In addition, basic research like this allows us to lay the groundwork for exploring deeper, more interesting questions. Are dogs that are less sensitive (or hyper sensitive) to social cues more likely to have behavior problems? Are they more likely to be rehomed? Why did they respond more to the faces of people than dogs? Does this have implications for dog-dog relationships and dog-dog aggression? Is this related to selective breeding – are we inadvertently focusing more on dogs’ behavior toward people than other dogs? If so, is this leading to increasing levels of dog-dog aggression? How can you use this information to apply to your life with dogs? Try to be aware of how your mood is affecting your dog. Is you are stressed or angry, that may not be the best time to train your dog. Or, maybe that’s a good time to give them something else to do – like chew on a Kong or play outside for a while – so that you don’t get overly frustrated with them. If you work with clients, make sure your clients understand that dogs are impacted by their negative moods and facial expressions. I also think there is value in filing this information away. Think about it when you are interacting with and observing dogs. Stay up-to-date on future research on social cognition in dogs and gradually build up a strong picture about what we think is going on inside their heads. This will inevitably make you a better at training, living with and working with dogs. Are there other questions that came to mind when you read the results of this study or other ways you can think of to apply this information to working and living with dogs? Please share your thoughts in the comments section below!